The Boxing Truth®: Duno Scores Convincing Win In Second Fight In The U.S.
Duno Scores Convincing Win In Second Fight In The U.S.
Press Release: September 25, 2017 By Sanman Promotions – Romero “Ruthless” Duno didn’t disappoint in his second U.S. fight, scoring a unanimous decision win over Mexican Juan Pablo Sanchez at the Forum in Inglewood, CA on Saturday Sepmtember 23rd. (Sunday, September 24th Manila time.) Duno, who recorded his 15th win in 16 matches with 13 knockout victories, inflicted Sanchez a huge cut above the left eye in the fifth round en route to tallying the convincing victory. The three judges, Rudy Barragan, Pat Russell and Fernando Villareal, all scored the bout at 78-74 for Duno, whose first stint in the U.S. was a resounding second round knockout win over erstwhile unbeaten Chimpa Gonzalez last March 10th at the Belasco Theatre in Los Angeles. Sanchez fell to 30W-14L-0D, 8KOs. “I’m happy with the victory. He is very tough. But I gave my best,” said the 21-year-old Duno. Duno said beating a tough fighter like Sanchez will serve him well in the future as he gears up for more tougher fights in his quest to become a world champion. “I’m sure I will bring this experience to my next fight,” he said. Duno’s big bosses were satisfied with Duno’s performance. “The opponent was a very tough one and also good. We are happy with the victory,” said Duno’s manager Dexter Tan, chief finance officer of the General Santos City-based Sanman Promotions. “A great win for Duno and a good learning experience.,” said Jim Claude Manangquil, chief executive officer of Sanman Promotions. Manangquil said Duno will be taking a short break before mapping out their next plan. 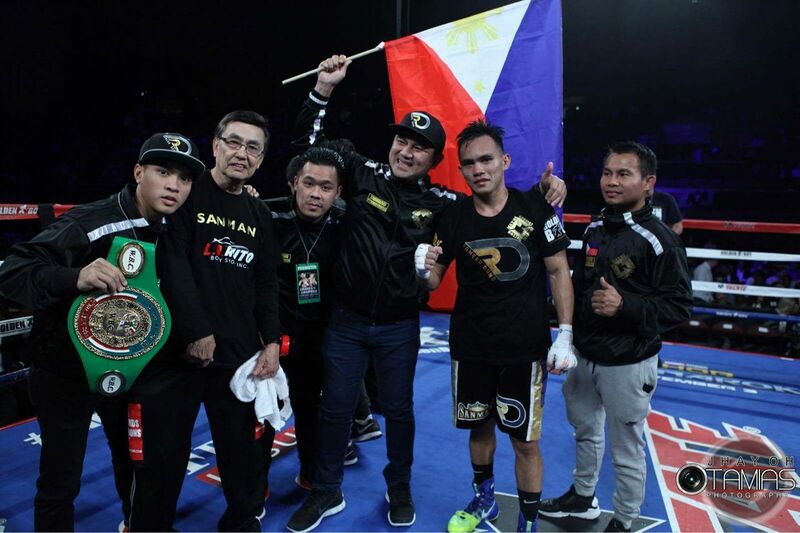 “We will celebrate this win first then we will discuss with Golden Boy Promotions what would be our future plans for Duno,” Manangquil said. For more information about Sanman Promotions please visit their official Facebook page at: www.facebook.com/SanmanPromotions.